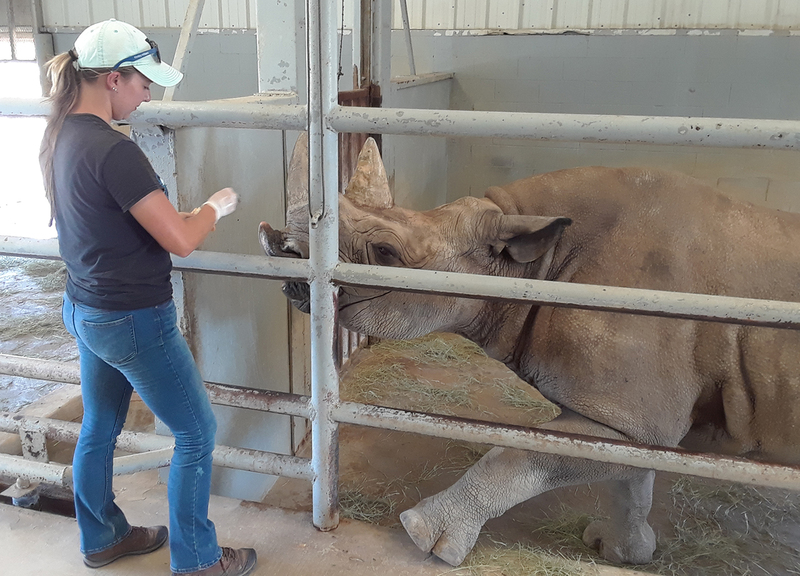 Over seven months at Fossil Rim Wildlife Center, Rachel Coxon learned a lot about rhinos, but also went the extra mile to maximize her internship experience. 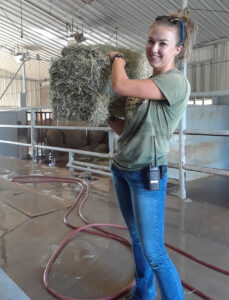 From Jan. 8 to Aug. 7, Coxon was the facility’s rhino intern. 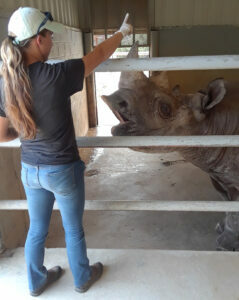 Rachel Coxon trains the black rhino “Mupani” on foot behavior to check her toenails and feet. Coxon did back-to-back rhino internships. Born in Washington, Coxon grew up in Tampa, Florida. She graduated from Florida Southern College with a degree in biology in May 2016, and has been accumulating experience via various internships since then. 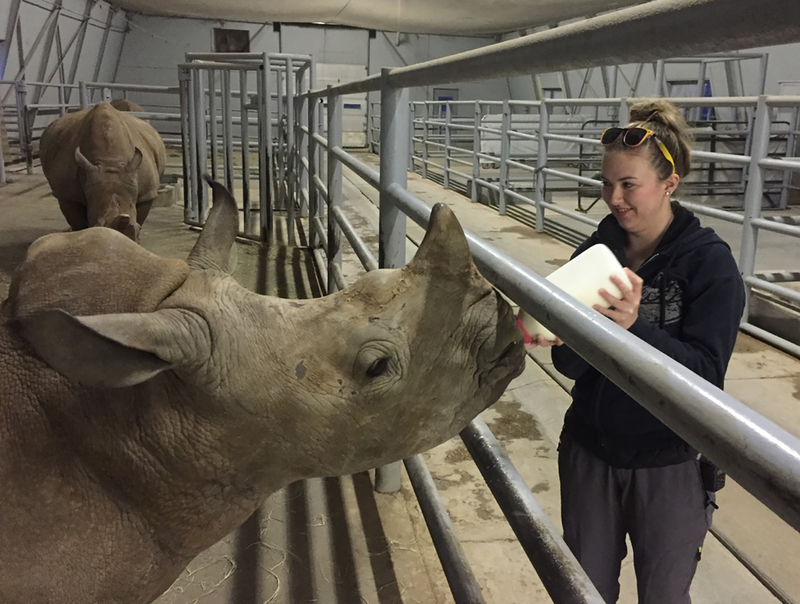 As rhino intern, Rachel Coxon would cut 60 pounds of browse per day to feed the four black rhinos. “I was always really into pets – dog, cat, and I had a bunch of gerbils,” she said. “But I didn’t know I wanted a career in animal care until college. I was going premed, and so I shadowed vets for a couple of summers. 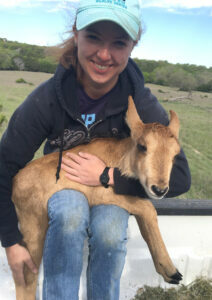 During her first month at Fossil Rim back in January, Rachel Coxon bottle-fed “Jiwe”. Coxon was expecting an experience more similar to her previous internships. Rachel Coxon feeds the black rhinos some coastal hay. As time passed and opportunities arose, Coxon jumped at the chance to diversify her experience. “I worked mostly with Tim (Lloyd),” she said. “We would do the rhino barn duties together, and I learned how to cut and gather browse from him. Then, over time I could handle it myself, but Tim still helped with the barn when he had time. Coxon also pursued shadowing opportunities with the animal health department. Rachel Coxon holds a sable calf while she helps the hoofstock department with a neonate exam. Before her time at Fossil Rim ended, Coxon did a presentation on her project. “My project was about conditioning a female black rhino for a transrectal ultrasound,” Coxon said. “The ultrasound probe is inserted to check the reproductive tract for abnormalities, check estrous cycles to confirm and track pregnancies more precisely than other methods. It’s a free-stall chute, so she can come and go as she pleases. Rachel Coxon trains the black rhino “Mupani” on “head-up” behavior. As she moves forward, Coxon has her preferences but wants to keep all options on the table. 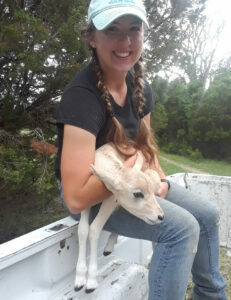 As someone with more Fossil Rim internship experience than most, Coxon was asked if she had suggestions for those who will apply in the future. When she shadowed the animal health department, Rachel Coxon learned how to do blood draws. 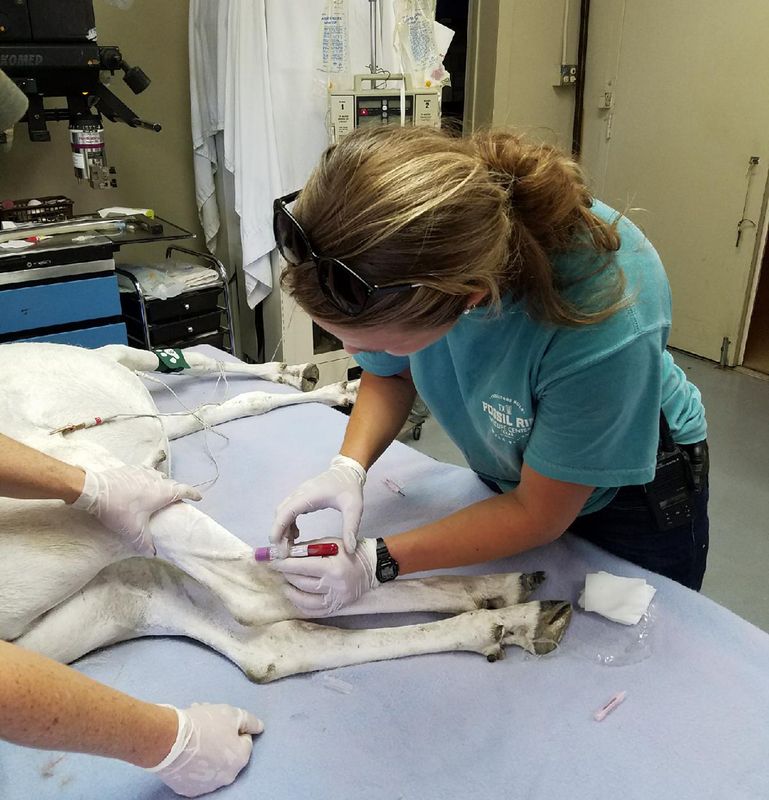 In this case, she is drawing blood from an addax. 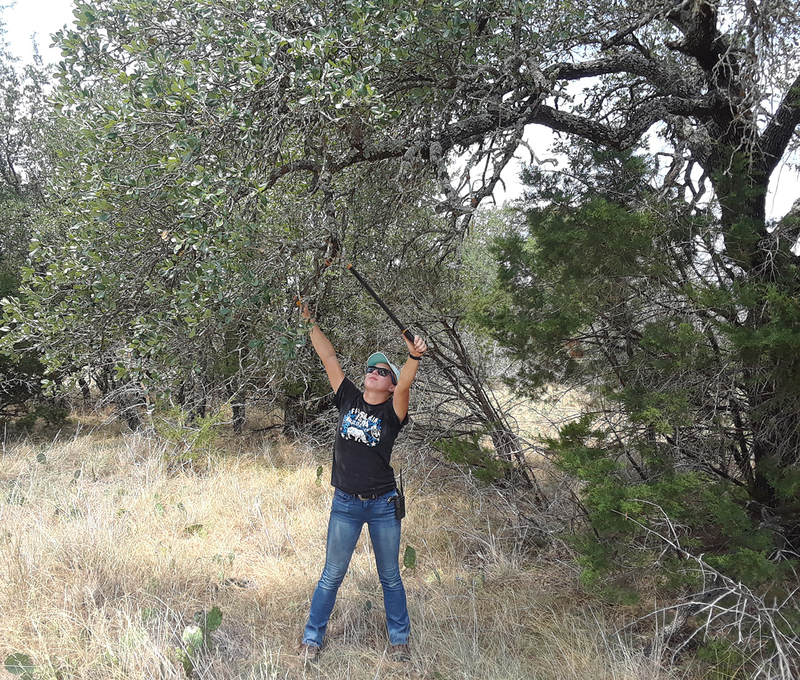 For first-time visitors to Fossil Rim, she recommends a particular activity.